1. Boil chicken stock, when boiling, reduce to medium heat. 2. Add sotong balls to cook. 3. Add in fusiilli & let it cook for 8 mins, stirring it once a while. 4. 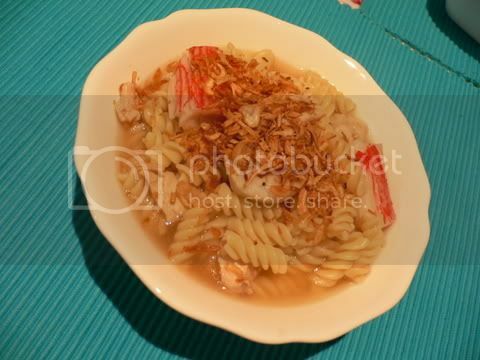 When fusilli is done, add crabmeat and mix well into the soup. 5. Serve with shredded chicken & garnish with toasted onions. (Claypot) Chicken Rice but using a rice cooker to cook it instead of a claypot. 1. Marinade chicken with the above seasonings. Set aside for 30mins. 2. Heat 1tbsp extra virgin olive oil in wok, add in soften mushroom to fry till fragrant. 3. Add chicken pieces, chinese sausage to fry together with mushrooms. Dish out &put aside. 4. Mix rice with the seasonings & water. Put into rice cooker & cook rice as per normal. 5. 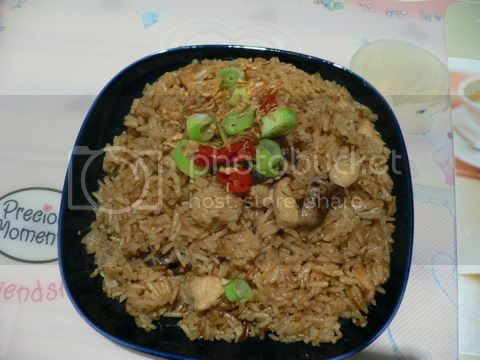 When rice is almost cooked, add the previously cooked ingredients & continue to cook the rice. 6. Dish rice out, garnish with spring onions & fresh red chilli.